Shell model 36 mm and a length of 23.35 mm made of steel or gold-plated steel. When you look at the clock, there is a sense that they have two buildings. This is due to design idea, resulting in a bezel forms a shape around the main body. 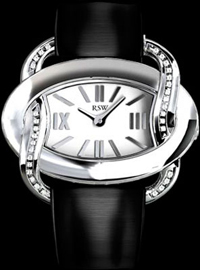 Bezel fully set with diamonds, circles around an elegant oval shell. The collection also has a model without diamond bezel. The dials are also made in several colors: black, gray, white, brown. 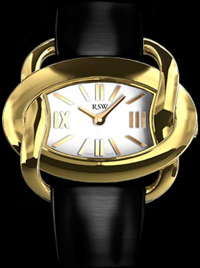 They are equipped with Roman numerals, two hands, as well as company logo RSW at 12 o’clock. Protects dial sapphire crystal. New product is built on the basis of Swiss quartz movement ETA 901,001. Water Resistant – 3 ATM. Windflower model comes on a satin strap with folding clasp or a steel bracelet. 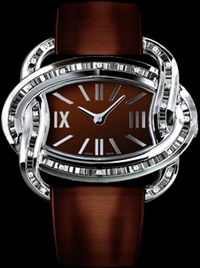 Original new, recommended retail price of 395 Swiss francs, will shine on the wrists of women, complementing their elegant image.